I usually eat lettuce and veggie salads for lunch, but I haven’t been in the mood for them lately. Maybe my mind is still in Winter mode even if my soul is desperate for Spring. Instead I’ve had hot meals like pork egg roll in a bowl, vegetarian chili with rice, and egg rice stir fry. All of the sudden, with a little more light in the evening I find myself switching back to cold salads because I’m craving Spring. This salad is colorful and it reminds me that Spring is here even though it’s still cold here in CT and we keep getting snow. Womp womp. With Spring every year comes the reminder that bathing suit season is right around the corner (gah!) so I’ve kicked my healthy eating into high gear. 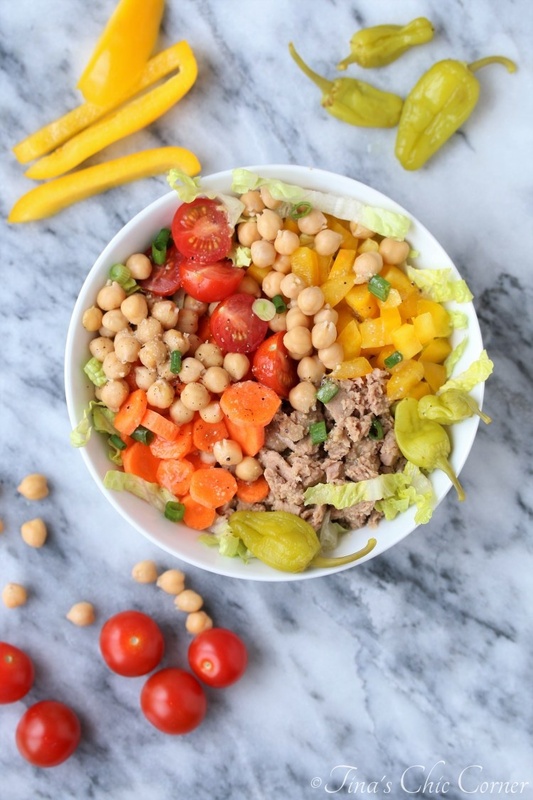 I hope you aren’t tired of seeing healthy lunch recipes (which can also be used for dinner). I promise to throw in a sweet and fatty recipe at some point (maybe I can convince my husband to make one), but for now my life revolves around counting points, which means low calorie and high protein food. 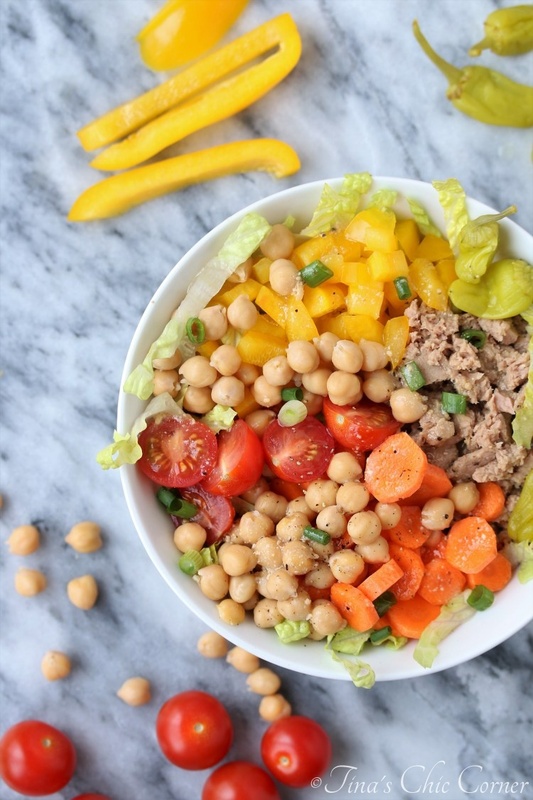 If absolutely nothing else, this salad is brightly colored and that makes me think of warmer days. 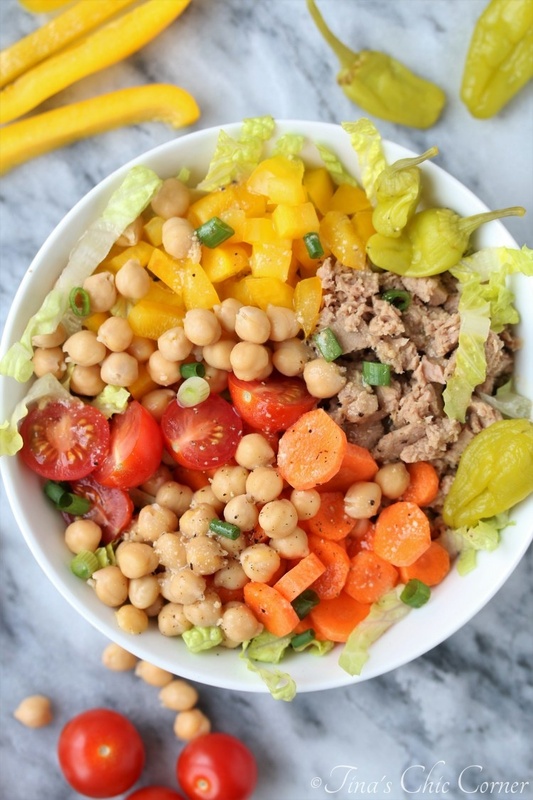 In a medium bowl, add the lettuce, tuna, tomatoes, chickpeas, carrot, bell pepper, scallion, and pepperoncini peppers.